Rather than leaving the subway system to go into disrepair, the city of Cincinnati should restore and renovate the abandoned system to create a hub for community activity and interaction through adaptive reuse. In the early twentieth century, the city of Cincinnati began an upgrade of their electric streetcar system by developing a series of tunnels for a subway transit system beneath the streets of the city. At the time, Cincinnati was one of the seven most populous cities in the US with an economic growth that rivaled New York and Chicago. The new subway system was to be the solution to the growing transit nightmare of the slow and outdated streetcar in a rapidly developing city. Construction was postponed in 1917 when the US entered World War I, which resulted in a temporary abandonment of the project. After the war ended in 1918, costs nearly doubled due to post war inflation, but construction began January 28, 1920. Over the course of seven years, funding ran out for the project with only seven miles of the tunnels dug and none of the tracks laid out. Plans to raise more funding for the project were struck down with the crash of the stock market in 1929. The project underwent a revival in 1939 by the Engineer’s Club of Cincinnati but was ultimately abandoned again due to World War II. Today, the subway system is recognized as the largest abandoned transit tunnel in the United States. Former Cincinnati mayor Mark Mallory has said, “ Now more than forty percent of Cincinnatians do not know there is a subway system existing underneath Central Parkway Boulevard.” Rather than leaving the subway system to fall into further disrepair, the city of Cincinnati should restore and renovate the abandoned system to create a hub for community activity and interaction through adaptive reuse. One of the greatest benefits of adaptive reuse is cost reduction. The reuse of the subway system would save the city millions of dollars in costs of demolition and re-grading the land that was dug into. In recent years, there have been proposals from city planners to demolish the tunnel system in order to create more residential and retail space in the city, however the city has struck down plans of demolition due to the high cost and time it will take. The structural work is already completed in the tunnels; all that would remain is updating the lighting and ventilation systems to be more sustainable and efficient for a public space of that size. Another benefit of reuse is it creates more sustainable buildings and spaces. Much of the architecture we have today has a finite longevity to its lifetime, only to be demolished and replaced by another building when the previous one could probably have served the new purposes. 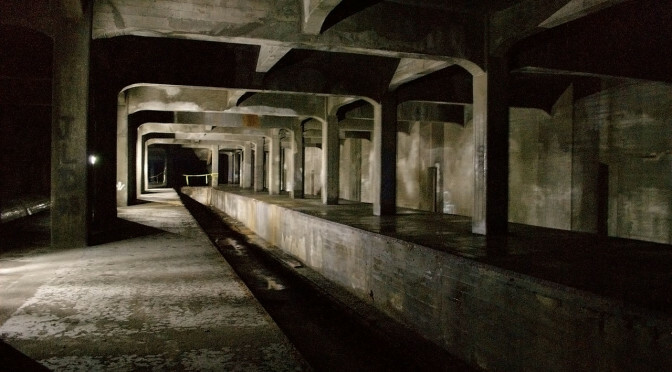 Transforming the abandoned subway into a hub for community activity would create a new framework for interaction and an opportunity to connect the surrounding neighborhoods that would otherwise remain separated from each other. This is important for the city because it can reduce the crime rate and territorial conflict by creating a more woven integrated community. This hub would also be an ideal space for small local businesses and farmer’s markets to set up and create local economic growth. An additional advantage to the tunnel system being reused is it is such a large space that it can be used for a wide range of temporary venues and activities. Although there are a number of benefits of the adaptive reuse of older buildings, there are also some setbacks and people who advocate against its practice. One of the most common setbacks include updating the existing systems in the building to comply with present day codes. This particular issue is typically the main reason that many developers decide against adaptive reuse when deciding on a location for their project. They assess the original systems and structural elements installed in the building and determine the cost and time it will take for the updates they will need to make. In the case of the Cincinnati Subway System, the ventilation and lighting systems that were installed in the 1920’s are completely outdated and would need serious updating in order to meet todays standards. The cost of this alone in the several miles of tunnel is enough to turn away any developer from the idea of adaptive reuse. This issue also segues into the matter of energy efficiency. It is one thing to put new systems into the building, but then comes the question of will they work efficiently with the structure? This becomes a difficult set of criteria to satisfy when it comes to an underground structure like the tunnel system. Lighting would be extremely intensive because of the nonexistence of natural light. However, this can be worked around with the incorporation of skylights or solar panels that would power the lighting. In addition to lighting comes ventilation, due to the intersecting paths of the tunnels, natural cross ventilation cannot be relied on. One final opposition to practice of adaptive reuse is the client’s desire for something new. Human nature tells us that newer is better. As today’s technology advances, so does the way we look at architecture, and as a result so does the client’s. However, a major point that can be made in defense of adaptive reuse of older buildings is many states and private entities offer grants and federal tax credits that help cover up to twenty percent of the cost of development when it comes to reconditioning older, historic buildings. Most people would rather see something new and modern looking, than the restored beauty of an older building. In regards to historical buildings, Martin Johnson, CEO of Isles, a non profit community development and environmental organization said, “These buildings were designed to last. They were built in such a way that you know they are going to be there tomorrow.” There is something to be appreciated from the resilience of older buildings that use brick and masonry amidst the rapidly growing cityscapes of steel and glass. Boschmann, E. E. and Gabriel, J. N. (2013), “Urban sustainability and the LEED rating system: case studies on the role of regional characteristics and adaptive reuse in green building in Denver and Boulder, Colorado.” The Geographical Journal, 179: 221–233. Bullen, Peter A., and Peter E.D. Love. “The Rhetoric of Adaptive Reuse or Reality of Demolition: Views from the Field.” The Rhetoric of Adaptive Reuse or Reality of Demolition: Views from the Field. Elsevier Publishing Co., 9 Apr. 2010. Web. 06 Sept. 2015. Corral, Andrea. “Repurposing Old Buildings More Satisfying than Knocking them Down.” Las Vegas Business Press 31.29 (2014)ProQuest. Web. 6 Sep. 2015. Carroon, Jean. “P.7-42; 47-55.” Sustainable Preservation: Greening Existing Buildings. Hoboken, NJ: Wiley, 2010. N. pag. Print. Kaewket, Dachamont, “Power shift: a catalyst for architectural transformation : rapid transit, Cincinnati” (2015). Masters Theses. Paper 8. KERSTING, JESSICA. “INTEGRATING PAST AND PRESENT: THE STORY OF A BUILDING THROUGH ADAPTIVE REUSE.” Electronic Thesis or Dissertation. University of Cincinnati, 2006. OhioLINK Electronic Theses and Dissertations Center. 06 Sep 2015. Rabun, J. Stanely. “Structural Analysis of Historic Buildings.” Google Books. John C. Wiley & Sons, Inc., n.d. Web. 06 Sept. 2015.